Design is everything! 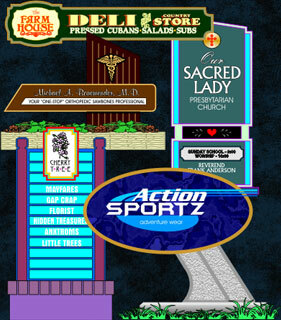 Use our thirty years of design experience and easily sell your customers a sign that they will praise you for. We can help you close more sales simply by design. Effective graphic design is no accident at Skywatch Signs. Years have been spent studying the relationship between typography, use of color, and the compositional relationship between graphic design elements. Our designs always stand out in a sea of visual havoc. Our design skills are still being honed even after all of these years. Our passion for design is what drives us to create beautiful and truly effective signs. Architects, builders, display designers and even our corporate clients consistently rely on our knowledge and expertise to solve their visual communications needs. If you need help with a project, call or email us.